Binary options are the latest products to hit financial markets. From 5 minute FTSE100 bets offered by online bookmakers, longer duration FTSE100 bets traded on online betting exchanges plus binary bets offered by spreadbetting companies, all are offering the same instrument as the CBOT's binary option on the Fed Funds rate. Hitherto, the largest single marketplace for binary options has been Lloyd's of London where they are known as insurance contracts, while the sports enthusiast is unwittingly buying a binary option every time he takes a price from a sportsbook or bookmaker on this horse or that soccer team. This book takes the same fixed odds bet and illustrates how they operate in the financial marketplace. "Binary Options" initially outlines regular bets and explains the rationale defining some basic winning and losing bets. A deeper analysis follows in which the author examines how the value of a bet is dependant on the passing of time, the volatility of the underlying instrument plus the price of the underlying instrument.More advanced bets are introduced with the reader then being shown when and how to profitably use binaries in various market conditions, followed by techniques in how to hedge the position entered into. The same format for regular bets is then followed when discussing one-touch bets. 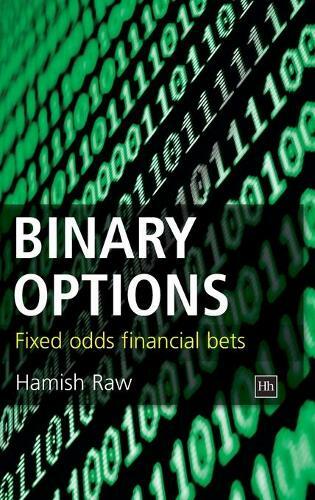 In this first in-depth analysis of binary options, Hamish Raw has ambitiously catered for both the end-user and the market-maker. Diagrams are to be found in abundance throughout this book in order to graphically illustrate the author's points.